I was originally drawn to Plowing with Pigs and Other Creative, Low-Budget Homesteading Solutions because I am planning to raise pigs, but it turns out you really can’t judge a book by its cover! 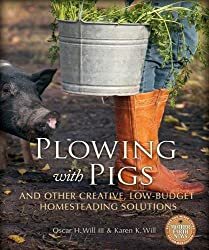 While there is a chapter about pigs and the many ways they can help you around your homestead, this book is actually a collection of many different affordable homestead solutions. The book is written by husband and wife team – Oscar H. Will III and Karen K. Will – who run Prairie Turnip Farm near Topeka, Kansas. Oscar is a scientist, farmer, and editor-in-chief of GRIT magazine. Karen was editor of Heirloom Gardener magazine and she also wrote Cooking with Heirlooms: Seasonal Recipes with Heritage-Variety Vegetables and Fruits before her untimely death a couple of years ago. In Plowing with Pigs, Oscar and Karen share their homesteading wisdom about many different topics. So, if you’re specifically looking for information about pigs, this may not be the first book you should pick up. But, if you’re looking for a general overview of many different homesteading topics, then you’ll enjoy this book. The overall focus of this book is on making use of what you already have and saving energy – from using animals to help with farm labor to re-using building materials – in order to save money, be as sustainable as possible, and have fun! Section I: Animals includes a chapter about free-range fowl (chickens, turkeys, waterfowl, and guineas) including their potential roles on your homestead and basic caregiving guidance. The next chapter in this section is Plowing with Pigs (described further below). And the third chapter is about working with goats, sheep, and cattle to collect solar energy, improve your soil, produce food, and more. Section II: Bounty in the Woodlot and Hedgerow includes a chapter about fencing (living fences, windbreaks, shelter belts, and other fences built with low-cost materials). There are instructions for building a fence, pasture gate, and stacked rail gate. Another chapter covers many different tools you’ll need for homesteading projects, how to grow and use your own lumber, and instructions for building a kitchen island and loafing shed. And in the final chapter in this section, you’ll learn how to make a hay rake, pitchfork, wooden-slate harvest basket, dibble, and mudroom bench. In Section III: Gym Membership that Pays, the Wills share guidance for preparing the land and cultivating row crops. There is extensive information about making hay and other forages and a chapter specifically about growing small grains such as wheat, oats, rye, and barley. Section IV: Home(stead) as a Production Center includes a chapter about cooking with guidance for stocking your pantry and tons of recipes. Two of the most interesting recipes were for rendering lard and making brown bread ice cream. In another chapter, the Wills share step-by-step advice for renovating your kitchen including choosing appliances, countertops, flooring, and eco-friendly materials. The final chapter focuses on creating, managing, and marketing a home-based food business. Although I was hoping to learn a lot more about pigs in this book, this section was still one of my favorites. The Wills explain how pigs can help you to prepare your garden and clear out weeds, dispose of food scraps and create compost, make mulch, remove stumps, and provide entertainment, too! Janie Hynson is an aspiring homesteader in North Carolina. She recently moved back to her hometown after living in Boston for six years and then traveling across the U.S. working on organic farms. Janie works in public health and sustainable agriculture and is interested in how health can be improved through homesteading. This post contains affiliate links. This means that if you purchase something after clicking on a link, Thrifty Homesteader will make a small percentage while you still pay exactly the same amount as you otherwise would. Thanks for your support. Thank you for posting this, it’s very interesting! I have wanted this book for soooo long! I am thrifty because I have no choice so I need to win so I don’t have to spend money ! I’d love to win this book for all homesteading tips. Never worked with pigs… But have heard about folks using them for plowing purposes. So, I’m also interested to learn how this is done. We plan to move to land in about two years. I am trying to prepare myself as much as I can now. My husband wants to grow a crop on some of our land which on a large scale is new to me.